MINT CHIP and VANILLA BEAN ice creams engraved in CHOCOLATE SYRUP, fluffy MARSHMALLOW GLAZE and CREME DE MENTHE finished with house-made WHIPPED CREAM and a MINT CHOCOLATE COIN from Shane Confectionery. “Nothing tastes sweeter than Honey, save Money” – Poor Richard. Two dipperfuls of Philadelphia VANILLA BEAN ice cream drowned in Franklin Fountain HOT FUDGE and topped with our fresh WHIPPED CREAM and a BORDEAUX CHERRY… an American icon. We make our fudge fresh using Wilbur’s dark chocolate, churned SMOOTH with fresh local milk, cream and butter, then cooked on-site in our antique copper candy kettle. Honest ingredients are the best policy for flavor. This inventions will surely electrify even the most enervated. A mountain of CHOCOLATE or VANILLA ice cream erupting in CHOCOLATE BROWNIE boulders, cascading with HOT FUDGE and blanketed in MALT POWDER. A dollop of WHIPPED CREAM indicates her smoking signal. A true display of Pompeii-an circumstance. 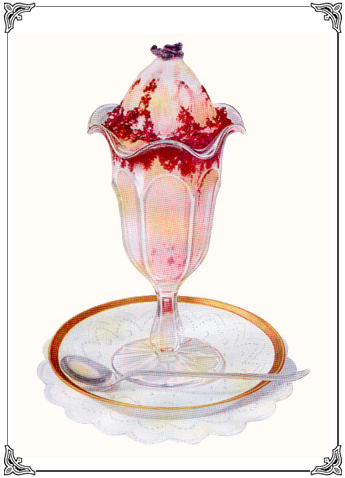 A solo act of fresh PEACH ice cream dressed in a curtain of RASPBERRY COMPOTE, bejeweled with ALMONDS and encircled with a necklace of ruffled WHIPPED CREAM. Following soprano Nellie Melba’s performance of Wagner’s Lohengrin in 1893, French chef Auguste Escoffier was moved to create an exquisite dessert for Dame Nellie. RUM RAISIN and PISTACHIO ice creams with salted PECANS and PISTACHIOS smothered in sweet hot CARAMEL and studded with CANDIED CAYENNE PECANS upon a WHIPPED CREAM bonnet. This Franklin Fountain original is as pretty as a sweet-talking LOUISIANA GIRL in her Sunday best. Two dipperfuls of CHOCOLATE or BANANA ice cream are shellacked in pure MAPLE WALNUTS, the syncopated sweetness cut by The Sting of prickly PINEAPPLE, crushed fresh, all keyed up with WHIPPED CREAM. William Dreyer and Joseph Edy concocted the first batch of Rocky Road ice cream in 1929 following the great stock market crash to give consumers something to Smile about during the impending Depression.